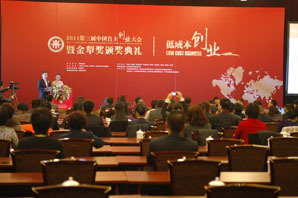 On Nov.27, 2011, "The Third China Independently Starting Business Conference of 2011 and the Awarding Ceremony of Golden Plough Award" sponsored by China Business and undertook by New Chinese Businessman magazine, New Chinese Businessman Net, China Independently Starting Business Organization Committee was held in Beijing conference center. World (Tianjin) Nutrition and Health Food Co., LTD was invited to attend the conference. 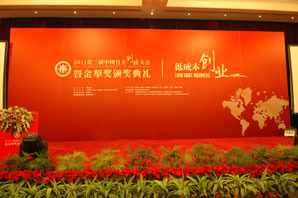 The site of the Third China Independently Starting Business Conference of 2011 and the Award Ceremony of Golden Plough Award. This conference took "Starting Business with Low Cost" as the theme and would issue extremely honorable award¡ª¡ª¡¡ãGolden Plough Award¡¡À to nearly 100 entrepreneurs and confer supreme honor on the entrepreneurs still working on the pioneering road, aiming at making them get the approval, help and concern of the society, enhancing the social credibility of the enterprise, promoting the brand image and popularity of the enterprise and improving the personal industrial standardization level. 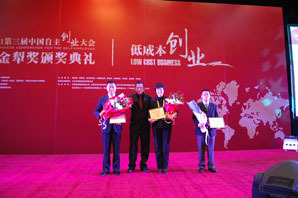 At the conference, World (Tianjin) Nutrition and Health Food Co., LTD won ¡°Golden Plough Award¡± 2011 China Model Enterprise of Starting Business with Integrity. 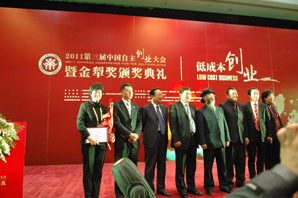 World (Tianjin) Nutrition and Health Food Co., LTD won ¡°Golden Plough Award¡± 2011 China Model Enterprise of Starting Business with Integrity. Keeping the management quality of ¡°So said, so done¡±persistently, Green World actively fulfilled social responsibility and pursued customer satisfaction in good faith. It integrated the traditional noble virtue of ¡°Honest and Keeping Faith¡± which had been inherited for thousands of years into the enterprise culture and operational management and treated people and affairs in good faith, sincerely produced high quality products for people and good performance for society. In 2011, at the same time of steady operation and scientific development, World (Tianjin) Nutrition and Health Food Co., LTD also strived to integrate the honesty concept into each step of the group development, concerned the retribution for all circles of the society all the time in developing each business and has got outstanding achievements in the respects of supporting human health business and helping the distributors all over the world own wealth, etc. 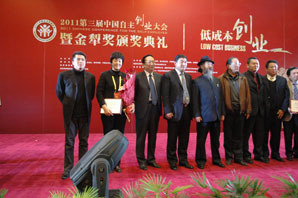 Awarded enterprises took group photos. 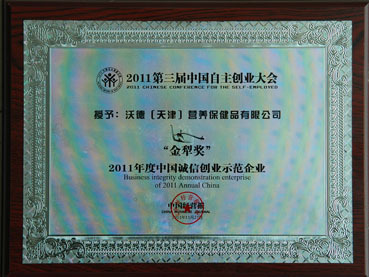 World (Tianjin) Nutrition and Health Food Co., LTD won ¡°Golden Plough Award¡±2011 China Model Enterprise of Starting Business with Integrity.